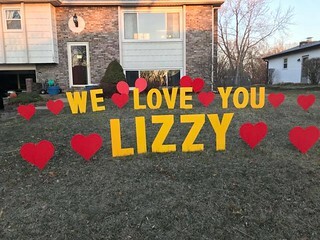 COLUMBIA, Mo 3/18/18 (Op Ed) -- What a gift Elizabeth "Lizzy" Joy Wampler and her family gave us, documenting their epic journey with a childhood cancer that claimed Lizzy's life Thursday. Like thousands of others around the country, my wife started tuning in on Facebook several weeks ago, when Lizzy's prognosis was looking up, only to take a dramatic turn for the worse. Lizzy's most striking feature, through it all, was her smile: radiant and permanent, even on her worst days. We often talk of "battling" cancer: she had osteosarcoma, a childhood bone cancer with a poor prognosis. But Lizzy's experience feels more like a journey than a war. She didn't lose a fight, but won a heart, many hearts in fact: friends and neighbors; the people she met at St. Jude Children's Research Hospital in Memphis; sports and entertainment celebs, like Michael Porter, Jr. and Kari Jobe. And the hearts of hundreds of strangers, who through their Facebook posts and other well-wishes, stepped out of their own busy lives to experience a gift: the empathy, compassion, and love that suffering inspires. People connected with Lizzy and her family because of the way they coped with pain, which may be the most universal human experience. We're not all successful; we don't all fall in love; we don't all believe in God or religion; our lives could not be more different. But at some point, we all experience pain. Lizzy turned her pain into a meaningful gift with lots of up time and very little down. "We are blessed with the most amazing family," father John Wampler explained on a medical expense fundraising site. Happily married for years; older brother and sister; and Lizzy, then nine, "who won the 'Sweet and Caring Spirit' award" at summer camp and dreamed of being a ballerina on ice, John wrote. Lizzy started limping around the house in late 2016, a problem that didn't strike her parents as too serious. But "one day, after wrestling with her brother, she fell on her knee and began to cry uncontrollably because of the pain." An MRI revealed the devastating diagnosis: osteosarcoma, a type of bone cancer that usually appears around knees. 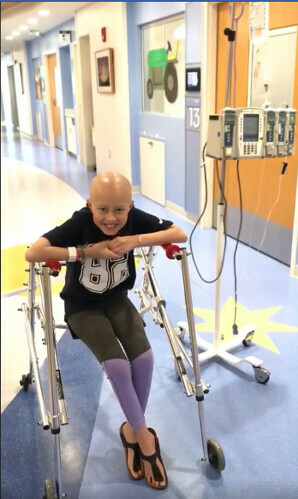 Osteosarcomas come in different types, or grades, and based on the rapid progression of Lizzy's cancer, she probably had a high-grade, fast-growing variety. The Wamplers had to move quickly, getting Lizzy to St. Jude Hospital, and leaving behind any semblance of their once normal, average, happy life. John and wife Jennifer Schmidt Wampler traveled every two weeks to St. Jude, forced to cut back everything else, including employment. The documentary they made of Lizzy's life -- video clips, photos, and running commentary -- included virtual visitors from her former school, Cedar Ridge Elementary; a Today Show visit when she was still on her feet; good days singing with friends and a ukulele; and awful days when metastasized tumors pressing on other parts of her body made the pain unbearable. The family journeyed forward, bravely and graciously, no one more so than Lizzy, who hated the departure but embraced the destination. She drove by Cedar Ridge Elementary about a week ago with her mom. "You have a lot of good memories there?" Jennifer asked. "Yeah," Lizzy said, in barely a whisper. "Lizzy sat up one night and I asked her what she was doing," her mother wrote March 13. "She said she was waiting for Communion. She shared her strong desire to go to Heaven and be free of pain." "God's view of this beautiful angel."